Reports progress of a lengthly operation in a window. This implementation can also format warnings. Its method can be invoked from any thread (it doesn't need to be the Swing thread), which make it easier to use it from some background thread. Such background thread should have a low priority in order to avoid delaying Swing repaint events. Creates a window for reporting progress. Notifies that the operation has finished. Releases any resource holds by this window. Display an exception stack trace. Notifies that the operation begins. Display a warning message under the progress bar. Creates a window for reporting progress. The window will not appears immediately. It will appears only when the started() method will be invoked. parent - The parent component, or if none. Returns the window title. The default title is "Progress" localized in current locale. Set the window title. A value reset the default title. Notifies that the operation begins. This method display the windows if it was not already visible. Notifies that the operation has finished. The window will disaspears, except if it contains warning or exception stack traces. Releases any resource holds by this window. Invoking this method destroy the window. Display a warning message under the progress bar. 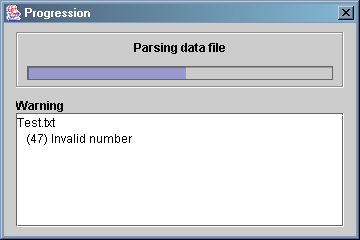 The text area for warning messages will appears only the first time this method is invoked.